The mute swan feeds chiefly on submerged aquatic vegetation, which is obtained by upending (tipping head first into the water, so that the tail remains visible above the surface) (4). It also feeds in fields on young cereal crops (8), spilt grain (4), and on artificial food sources, such as bread given by the public (3). Territorial disputes may result in aggressive fights between males, in which they rush at one another and slide along the surface of the water (2). Pairs typically nest solitarily, although semi-domesticated birds may nest in large colonies (6) (notably at Abbotsbury in Dorset) (8). The cone-shaped nest is built at the edge of the water, and may be used in subsequent years by the same pair (4). After mid-April, between 5 and 7 (up to 12) whitish or pale blue eggs are laid. They are incubated, mainly by the female, for 35-42 days; the young, known as 'cygnets', leave the nest soon after hatching (4). 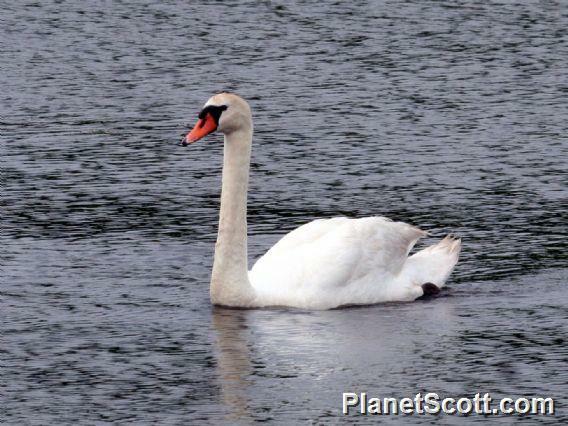 Both parents take care of the cygnets for an extended period, often until the next breeding season (4). Do park swans count as wild? Three of the birds, in particular, flew past me with all black beaks. Very common in Southern New Jersey.